In this competitive world, whoever develops these products and services first will have an enormous lead over the competition and be well positioned for the forseeable future. New blue chip companies and billionaires are certain to emerge in this new frontier. A list of potential products and services, in rough order from near term to long term, made from asteroidal and/or lunar materials, follows. 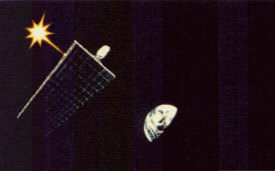 Medium-sized, next-generation, "large" communications satellite platform. 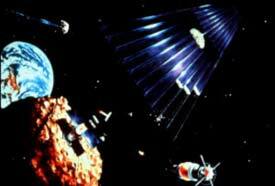 The beams of the platforms, the large antennas, bulk radiation shielding (not pictured), and fuel propellants for stationkeeping could come from asteroidal and/or lunar materials. Eventually, the solar cell power plant and heat radiators, too. In any case, who can compete with services from this? Not Teledesic or Iridium. It will make a lot of competitors obsolete, so if you can't beat us, join us. Artist: David Egge. Copyright owner: Gary C. Hudson (Hudson Engineering, Menlo Park, CA); used in his newsletter "The Commercial Space Report". 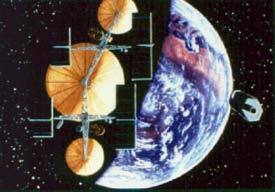 This is an illustration of an orbital antenna farm as proposed by the Director of COMSAT Labs, Burt Edelson. Solar Power Satellite (SPS) - producing electricity in orbit from the sun, and radio-beaming it to power plants on Earth. Located in geostationary orbit above Earth. A receiving antenna (rectenna) on Earth converts the SPS radio beam into electricity for wiring to homes, offices, factories, etc., by regular power lines. 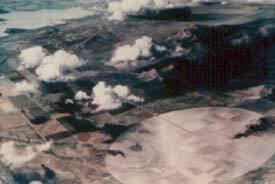 The microwave radio beam is safe, with crops and livestock underneath it, and safe to birds and airplanes. Source: Boeing Company, artist Jack Olson, produced with the support of NASA and US Dept. of Energy sponsored studies of SPS. For PERMANENT information on some companies, organizations and individuals who are looking into missions related to utilization of asteroidal and/or lunar materials, see the PERMANENT Mission Plans and Concepts section � 8.